On April 24, the museum teamed up with Kokua Hawai‘i Foundation to hold a Magic Island cleanup as part of programming for the Spalding House exhibition Plastic Fantastic?. We were thrilled with the great turnout—300 people (many of them staff of our corporate partners!) 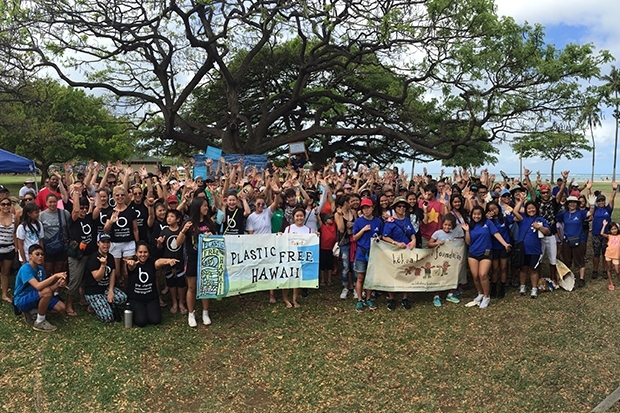 made their way to Ala Moana Regional Park and collected a total 340 pounds of trash. If you were part of the team filling oversize feed bags with garbage—mahalo nui! The cleanup went off without a hitch and thanks to our volunteers, left the park more inviting for the public. Here are the numbers. The museum thanks Kōkua Hawai‘i Foundation, Bank of Hawaii, First Insurance Company of Hawaii, LIST Sotheby’s, Bloomingdales, Farrington High School, Punahou High School Key Club, and all the members and individuals who came out to make this event a success. Posted in Behind the scenes, Beyond the museum, Museum staff, Museum ‘ohana, Partners · Tagged: Kōkua Hawai‘i Foundation, Plastic Fantastic?